A "yellow vest" demonstrator lost his hand Saturday during clashes outside the main parliament building in Paris, witnesses told AFP, during a 13th weekend of anti-government protests across France. "We put him to one side and called the street medics. It wasn't pretty: he was screaming with pain, he had no fingers - he didn't have much above the wrist," he said. 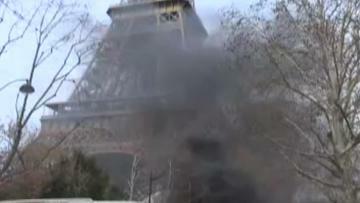 Paris police confirmed that a demonstrator injured in the hand been treated by paramedics, but did not elaborate. By 2pm (1300 GMT) officers had arrested 10 people, they added. Thousands more protesters turned out in the French Mediterranean ports of Marseille and Montpellier and also in Bordeaux and Toulouse in the southwest - strongholds of the movements - and in several cities in the north and west of France. Interior ministry figures issued at 2pm put the turnout across France at 12,100, of whom 4,000 marched in Paris, down on the previous week's figures. But last week's official estimates were disputed both by march organisers and an independent estimate carried out for news media. But a YouGov poll of 1,037 people issued on Thursday suggested that nearly two out of three people in France (64%) still support the movement. It was carried out on January 30 and 31.